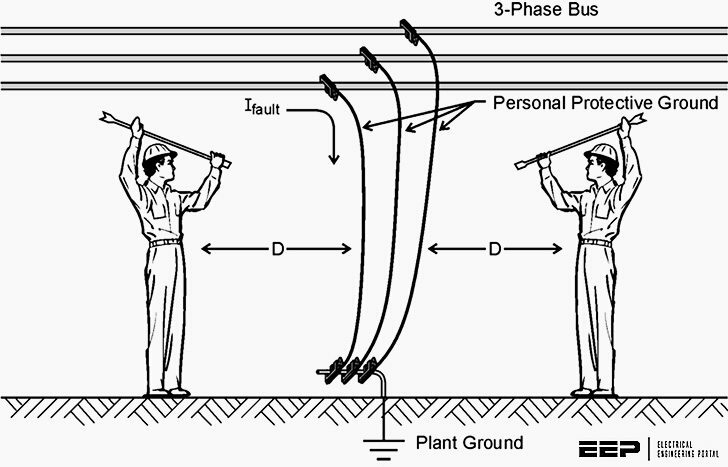 This Facilities Instructions, Standards, and Techniques Volume is to establish clear and consistent instructions and procedures for temporary grounding of deenergized and isolated high-voltage equipment (over 600 volts) for the purpose of bare hand contact. This FIST applies to those facilities of the FEederal power and water systems for which the Bureau of Reclamation (Reclamation) and its contractors and agents are responsible, and includes power and pumping plants, switchyards and substations, and transmission lines. These instructions and procedures supplement the requirements in Reclamation Safety and Health Standards, “yellow book”. Adherence to these procedures will enable workers to perform their duties with maximum confidence and safety. In the event of a difference between the requirements in this FIST and those contained in the Reclamation Safety and Health Standard, the more rigorous requirement shall apply. The primary purpose of personal protective grounding is to provide adequate protection against electrical shock causing death or injury to personnel while working on de-energized lines or equipment. This is accomplished by grounding and bonding lines and equipment to limit the body contact or exposure voltages at the worksite to a safe value if the lines or equipment are accidentally energized from any source of hazardous energy. The greatest source of hazardous energy in most cases is direct energization of lines or equipment from the power system.